Posted on 18 August 2013. Zambia’s food security is under threat and government faces a serious and critical challenge to address the problem which if not rectified will plunge the country into untold hunger, warns Forum for Development and Democracy (FDD) president Edith Nawakwi. In an interview Ms. Nawakwi told the Daily Nation that the problem the country was facing was that the government did not prioritize food security. Ms. Nawakwi said that food security was not about how much food one ate but how much food people had in their households. She said that as FDD they believed that farmers needed to be supported and the government should come up with a minimum programme for people who are involved in agriculture in order to create the needed wealth. Ms. Nawakwi said that what was missing in the Zambian agriculture was the promotion and support of small scale farmers to venture into cash crops for sustainable development . “When we form government we expect our policies to support farmers instead of running down the contingent for by-elections, these are choices that are available to a government. Ms, Nawakwi observed that issues of food security especially for Zambia were critical because of the prevailing regional hunger calamities, adding that Southern Province was just one of the regions that did not do well in the crop production during the 2012-13 farming season. She said that there was no country in the world that treated the agriculture sector with lack of seriousness, adding that it was not a misconception or politicking to suggest that Zambia was facing critical food security. “There are places in the country which did experience the bumper crop harvest like Southern Province because they were hit by draught, they need relief food and so when you get statements from the Minister of Agriculture who should be appealing to his colleagues at the Ministry Finance to take a front role in solving food problems in the country,” she said. Ms. Nawakwi also said that she was frustrated with the PF government for failure to address challenges the people of Zambia were facing in all sectors of society. She said that although some government ministers failed to analyze the country’s poor food security, it was only fair that the people of Zambia were told the truth about the prevailing food security situation in the country. 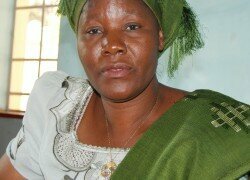 “They call me frustrated, yes I agree with Fackson Shamenda when he said that I am frustrated, yes I am frustrated there is no politician worth is salt is happy and comfortable with what was going on in the country because the people of Zambia are not receiving the preliquites they voted the PF into government for,” said Ms. Nawakwi.